Fylde RFC will almost certainly play their last game in London for at least 18 months tomorrow – and head coach Warren Spragg questioned the ambition of any players who think that’s good news. The club’s relegation will finally be confirmed if they lose at Blackheath this weekend or if either Hull Ionians or Loughborough Students pick up maximum points. 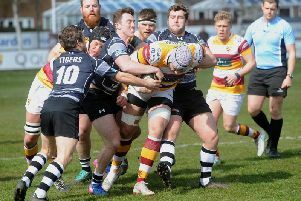 Fylde’s remaining six games in National One include four long-distance away trips of the kind they will avoid next season in the regionalised fourth tier of English rugby union. Spragg accepts a season in National Two North could have benefits for the club but he certainly doesn’t want his players looking at relegation that way. He told The Gazette: “As a player it should be not be your outlook to view a match in London as an inconvenience. “A long day travelling is a sacrifice you have to make because you love the game and because you have ambitions in the game. “Being realistic, more games against local teams next season should mean more away support and could help the community department to develop even further. “It could generate success for all areas of the club, which will mean we are stronger and more sustainable for National One this time next year. Fifth-placed Blackheath, who won 26-19 at Fylde in November, edged out Esher by one point in their last match three weeks ago. Fylde have lost ther services of forward Matt Garrod for tomorrow’s game due to tonsillitis.